Future Max is the Max who came back in time in the episode 'The End of the World'. He was named Future Max by the fans on the internet. He is from a future where the Earth is on the verge of falling to their enemies. Aliens came to Earth, and they have fought a thousand battles against them, but Isabel and Michael have died. With the help of a friend named Serena, Future Max and Liz make a plan to go back in time to change the future. Serena alters the granolith to make it a time machine and Max goes back to get Liz to help him make a different future. There has been much discussion about whether Future Max was real, a mindwarp, or another alien trick. I tend to think he was real, because of the scene at the beginning of the epi, showing him with Liz before he came back in time. If it was a mindwarp or a trick, why would they bother to make up an elabortate backstory. But, saying that, we have no way of knowing if Future Max was being coerced, tricked or mindwarped himself. Perhaps he thought he had no choice but to come back and change the past, but he had been tricked into it. Max was having second thoughts about going back, but it was his Liz who convinced him to do it. Perhaps she wasn't real, and was part of a mindwarp. Anyway, if he was real or not, here is all the info we know about him and his time. I think we can assume that everything before he came back happened in his time too. He and Liz only changed history after he showed up. Future Max came from the future, 2014, minutes before the fall of the Earth to evil aliens. It is never said if it was Khivar's troops, but he simply says the Earth was taken over by their enemies. We never see the condition of his Earth, or know exactly the amount of destruction, but there are bombs going off outside, and later Max mentions he has been in a thousand battles. The Earth's cities could be in ruins. FUTURE MAX: 14 years from now, we are taken over by our enemies. LIZ: Uh, who's taken over? Liz asks him how they can change the future. LIZ: The...the end of the world? 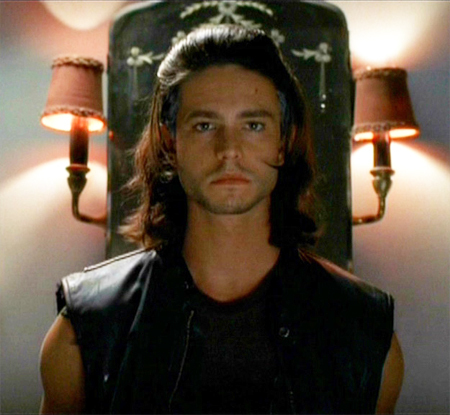 FUTURE MAX: The closer that you and I grew, the worse it got with Tess, and eventually she left Roswell. FUTURE MAX: Because of me, and how I treated her. And it turned out Tess was critical to our survival. The four of us - Michael, Isabel, Tess, and I...we made a complete unit. We all had different gifts, and with one of us missing, we weren't as strong, and everything fell apart. LIZ: So, um...you want me to help you and Tess get together? LIZ: Why don't you just go to Tess? FUTURE MAX: It's you I trust. It's you I have faith in, and because it's not just about getting me close to Tess. I need you to help me fall out of love with you. Max and Liz are still together in the future, even after all of the war and hard times, and they seem just as much in love as ever. Max can't stand to leave Liz, but she begs him to, so he can try to save them all. He thanks her for every kiss and smile, and they are both near tears as the granolith sends him away. Liz collapses to the ground when he disappears. Of course the young Liz is curious about her future with Max, and asks Future Max about their life together. LIZ: So, um...did we get married? FUTURE MAX: We eloped. We were 19. LIZ: We were 19? Wow, that is so young. That is too young. FUTURE MAX: That's what I said, but you said that Romeo and Juliet were even younger than us, so we drove to Vegas. Got married at the Elvis chapel. Congratulations, kids. LIZ: So we didn't have a real wedding. FUTURE MAX: Oh, we had a great wedding. You called Maria, Michael, Isabel, and Alex, and had them meet us halfway. We spent the whole night singing and dancing in some dive outside Phoenix, and at the end of the night, "I Shall Believe" came on the radio. LIZ: I love that song. FUTURE MAX: I know. Everyone else was exhausted, but not us. Oh, we danced...just the two of us. And ever since then, it's been our song. LIZ: If this works...I'm not gonna have that day. FUTURE MAX: No, you won't. Future Max tells Liz a bit more about how they got together. FUTURE MAX: You're supposed to be breaking up with him, not kissing him. LIZ: You...you kissed me. I mean...you know, he kissed me. FUTURE MAX: You're only making me love you more. LIZ: I just said no to Gomez. FUTURE MAX: You said no the last time, too. I didn't take no for an answer. LIZ: So we went to the concert. FUTURE MAX: No. The night of Gomez I came to your room. That's the night that things between us were cemented. FUTURE MAX: We made love. LIZ: No, no, we...we didn't. No, I have no intention of making love to you or...or anyone else at this particular stage of my life. FUTURE MAX: I beg to differ. LIZ: No. Making love to you is the farthest thing from my mind. I...I don't even have protection. LIZ: Oh, that's great. There you are, Max the Saint, just walking around with a condom in his back pocket. I...I...I don't even care what happened in your reality. I am not making love to you or anyone until I am ready, and I am just not ready. FUTURE MAX: Liz, I am telling you what happened, and we have to change that. We have to. And so far, we've failed. Liz, it's not just Max that's the problem here. You are. You are not letting yourself change. Now you have to do something...before it's too late. Then Liz asks what will happen to him if they do get Max to fall out of love with her. LIZ: Then what happens to you if we succeed? I...I mean you. The future version of you? FUTURE MAX: If we succeed in changing history, a different version of the future will take place. All the events that led to who I am 14 years from now will be different. The man I am now will cease to exist. After trying again and again to make Max fall out of love with her, and failing, Liz can't stand to hurt herself of Max anymore. She begs Future Max to go to someone else for help, but he tells her what will happen, so she will continue. FUTURE MAX: It didn't work. We have to do something else. FUTURE MAX: You have to. LIZ: Do you know how hard it was for me to tell him that I didn't want to die for him? He's the only reason that I'm alive right now. You...you've...you gotta come up with another plan. Please go to someone else. I...I just...I can't do this anymore. FUTURE MAX: Just 25 minutes before I came here, I held Michael in my arms...dead. Isabel died 2 weeks before that. Now you have to do this. You have to find a way. All of our lives depend on it. LIZ: How? What can I do that's gonna make you turn away from me? FUTURE MAX: I don't know. After Liz's plan works, and Max sees her in bed with Kyle, she asks Future Max about the future they've created. LIZ: So Max and...Tess are going to be together now. FUTURE MAX: I don't know. I don't know anything now. This is a different world. LIZ: I'm gonna be alone. FUTURE MAX: Maybe. Maybe not. From now on, the future is to be determined. It's what've always said to you, Liz. We create our own destiny. Liz asks Future Max to dance, so she can have her wedding dance, and he twirls her away from him, and when she turns back, he has disappeared.